Pattern formation is one of nature’s most fascinating phenomena. Starting with the evolution of life: cells and compartments start to differentiate such that they are able to undertake different tasks leading to life of complex organisms. Additionally, cells are able to release messenger substances, which may lead to an aggregation of cells as in the slime mold Dictyostelium discoideum . 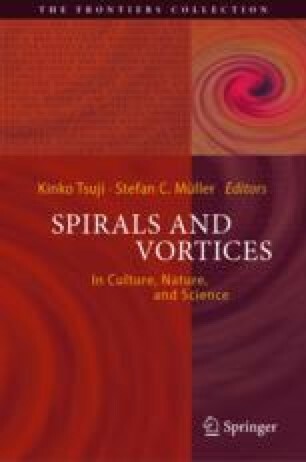 In this chapter, the formation of wave patterns, especially of spirals in non-equilibrium systems, is described. Starting with the revision of important aspects contributing to the historical development of synergetics, oscillating chemical reactions, such as the Belousov–Zhabotinsky reaction are described. Some theoretical aspects of reaction-diffusion systems and wave propagation in excitable media are outlined. The development and propagation of waves and thus, of spirals is described in such systems. At the end, the Belousov–Zhabotinsky reaction embedded in a compartmentalized system, namely an emulsion, is studied. Under the chosen conditions target patterns or spirals with segmented wave fronts evolve. These segmented waves (dashes) develop from a smooth one due to an instability. However, instead of forming a spiral turbulence, these dashes remain in an ordered configuration and form beautiful patterns.